Teedra Moses has released so many mixtapes over the years that it's become somewhat difficult to keep up with them all. If it sounds like I'm complaining, know that I'm not. It's always great when Ms. Moses releases new music and since this year saw her (finally!) closing the 11-year gap Complex Simplicity left with Cognac & Conversation, her issuing out a mixtape before the new year is my cup sure enough running over with the magic of Moses. Walking the same stride as contemporary sister, JoJo, Moses herself also celebrated a birthday this past week, and felt that the best way to let everyone in on the festivities was to deliver some pure musical fire in a compact short player. 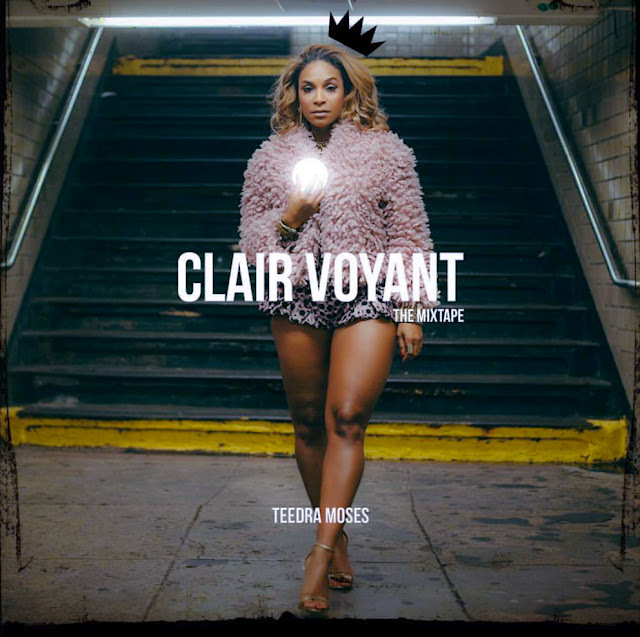 ClairVoyant is Teedra being Teedra, blending window steaming R&B with slabs of hip-hop sensibility, embracing classic quiet storm on the side. Featuring new and newly imagined cuts, ClairVoyant is one of Teedra's most multifaceted mixes yet. Teedra taking Kanye West's "Flashing Lights" for a spin and recruiting her background singer, J. Black to transform the track into a duet is a choice track, as is the mash-up to end all mash-ups,"Be Happy", where not only does she grab from the Mary J. Blige classic of the same name, but also merges Brownstone's "If You Love Me" and The Fugees "Fu-Gee-La" into the mix. Oh, and if you were already sick and tired of everybody and their mama's renditions of Drake's "Hotline Bling", then humor the song for just one last time as Teedra gender flips the script, letting us see things from the woman's point-of-view --- and to say she's not exactly in the throes of love is an understatement. Still the most hypnotizing moment is her rendition of Sade's "Stronger Than Pride" which is an acoustic affair that captures Ms. Adu's serene vibe nicely. Comprised of largely refixes and "homages", ClairVoyant is home to a few original cuts like the nocturne downtempo "Make It Beautiful" and the sugary sweet R&B of "Radio", and both are total charmers worthy of second glances. By mixtape's end Teedra makes things a family affair by allowing her sons, Ras and Taj Austin, to drop a few bars on the closer numbers. While the result of their contributions doesn't exactly flow with the rest of the project, their addition lets us know that Teedra is aware that celebrating important milestones in life means nothing unless you have your loved ones around to share the moment with you.